Knickernappies 2G Pocket Diapers are a MUST HAVE for newborns! For some moms cloth diapering is a clear choice from the very beginning and before baby is even born their stash may already be chosen for them. With the desire to save money and cloth diaper the most efficiently and economically, more and more moms are relying on one-size diapers to fit from birth to potty training. 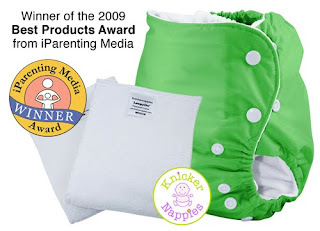 Something a lot of new moms or moms new to cloth diapering might not realize, is just how "fluffy" diapers can be on newborns, especially one-size diapers. Why do they seem so fluffy and bulky? Well their fit and bulkiness can depend a lot on the size of the baby at birth and what you choose to stuff the diapers with, but the simple fact of the matter is that in order for a diaper to fit a large toddler and a tiny baby the diaper has to be adjusted down to the smallest size and all that extra room has to be tucked away for future use. This is a not a huge issue, especially if you're aware of this fluffy phenomenon. The dilemma comes when moms realize that their cute little fluffy bottomed babies are not going to fit into their adorable little outfits they were gifted at birth. Some even worry that their tiny baby is uncomfortably overstuffed. The Knickernappies 2G Sized Pocket is the solution! Super soft fleece interior you'll love putting against your new babies skin. 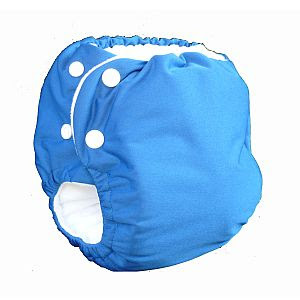 We recommend you have at least a half dozen (6) of these invaluable diapers in your newborns stash! And remember, even though they'll outgrow them, they'll still be in great shape and can be saved for future babies and/or re-sold. So, there really are benefits to have at least some sized diapers in your stash, even if your plan is to use one-size diapers the majority of the time. Give them a try, you won't regret it. what a sweet newborn picture!! These sound like a great option for me - just starting to build our stash, expecting our first in January! These sound great. Hopefully I will get a chance to try them! Thanks so much, I'll keep these in mind for our second baby. These will be great for when we're out of the house! I SO wish I could have had some Knickernappies when my youngest daughter was born in March. I have never tried them, but they look like an awesome newborn solution! I am wanting to try these for my new baby coming in Sept. I have heard great things about your diapers! I just got a 2G in the mail =) I can't wait to use it on my little girl when she's born, it looks so tiny though! I plan on using mainly OS diapers, but I want to have a small supply NB sized ones for when she's really small. That is so good to know about the lower amt oif bulk of these diapers for newborns! I'll have to remeber this brand/model. I will definitely be getting some of these before our next baby comes! I can't wait to try a Knickernappies diaper. I made the mistake of buying diapers made in China and am now kicking myself because the quality isn't what I had hoped for. Thank you for being made in the USA Knickernappies! What a fabulous idea! I really wish more hospitals would get on board with this!